Lately it has been a lot of work during the week and plenty of fun on the weekends. Three weekends ago I went wine tasting just North of Santa Barbara. Over Memorial Day Weekend I went to two screenings at the Hollywood Forever Cemetery: North By Northwest on Saturday and Purple Rain with Dam-Funkand Peanut Butter Wolf DJing on Sunday. I just got home last night from a great weekend camping in Sequoia and Kings Canyon National Park. 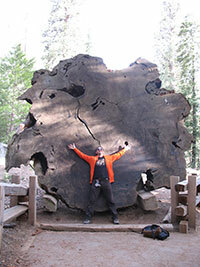 Here I am next to a giant sequoia tree that was cut down. How refreshing to get out of Los Angeles to a place without cell reception.